Fun Dip is a candy manufactured by The Willy Wonka Candy Company which is a brand owned by Nestlé. 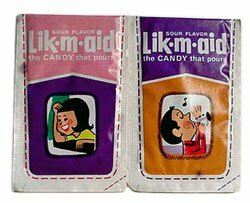 The candy has been on the market since the 1940s and was originally called Lik-M-Aid which did not come with a dipping stick. It was originally manufactured by Sunline, Inc, through their Sunmark Brands division, which was purchased by Nestlé in 1989. The candy was then renamed Fun Dip and added to the Willy Wonka product line. My brother Dan is only 2 1/2 years younger than me, so we played together a lot, and we were often friends with our friends' siblings. My friend Meghan, her brother/Dan's friend Ethan, Dan, and I were always trying to come up with a way to make money. Usually I came up with the ideas, everybody else came up with the plan of action, and we all worked together. Vintage Fun Dip candy wrapper image provided by The Candy Wrapper Museum. Used with permission.